Jimmy Rabbitte is a man with a vision - to bring soul music to Dublin. His friends Derek and Outspan ask him to manage their band ad Jimmy agrees, but only on his terms. He places an ad in the local paper which simply reads: "Have you got soul? If so, the World's Hardest Working Band is looking for you". And so were born THE COMMITMENTS. Award-winning Alan Parker's visionary movie about the rise and fall of a Dublinsoul band has taken the UK by storm, a No. 1 box office smash, attracting rave reviews and producing one of the hottest new musical talents in years. 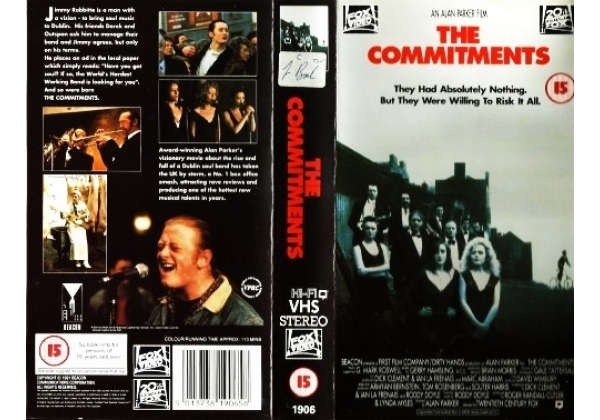 Or find "Commitments, The" on VHS and DVD / BluRay at Amazon.